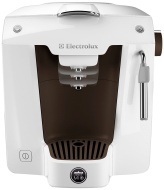 alaTest has collected and analyzed 14 reviews of Electrolux ELM5100. The average rating for this product is 3.9/5, compared to an average rating of 4.4/5 for other products in the same category for all reviews. We analyzed user and expert ratings, product age and more factors. Compared to other products in the same category the Electrolux ELM5100 is awarded an overall alaScore™ of 84/100 = Very good quality. The price! Of both machine and pods:) Flavour of pods excellent, love the option of no milk frother attachment, as my preference is caffe lungo,. The water tank is pretty small, not a massive drama, just needs refilling every two coffees. Took me a while to figure out the steam wand, instructions need to be more explicit.